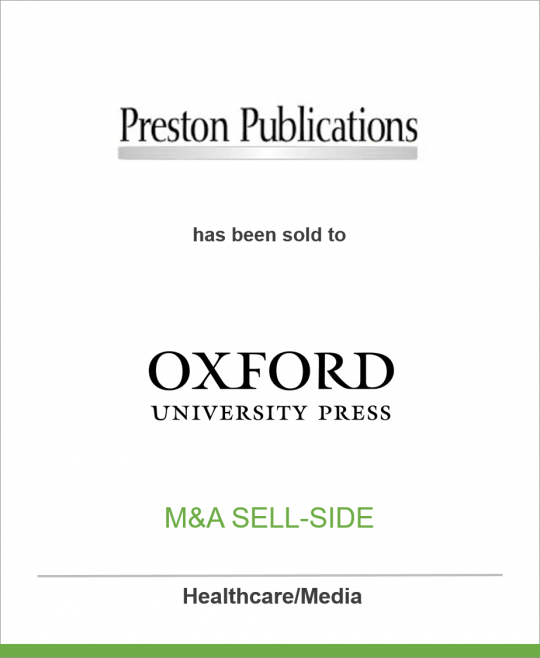 Oxford University Press (OUP) is pleased to announce the acquisition of two titles, Journal of Analytical Toxicology (JAT) and Journal of Chromatographic Science (JCS), from Preston Publications, in a transaction managed by DeSilva+Phillips. The acquisition of these two titles sees the continued strengthening of the STM journal list published by OUP. “We are delighted to be able to take on the publishing for these two titles. They have a rich history and we look forward to continue to build their reach, readership and influence,” said Alison Denby, Editorial Director for OUP’s US Journals Program. “At Preston Publications we are very pleased to entrust the continued growth of Journal of Analytical Toxicology and Journal of Chromatographic Science to Oxford University Press. OUP’s range of academic journals and their international reputation reaffirm our belief that JAT and JCS are in the right hands,” said Tinsley Preston, President, Preston Publications. Journal of Analytical Toxicology is a peer-reviewed, international toxicology journal, launched in 1977, focusing on potentially toxic substances and drug identification, isolation, and quantitation. It presents state-of-the-art techniques that address current issues in toxicology. Articles in JAT emphasize practical application and introduce improved and novel techniques for use in clinical, forensic, workplace, sports testing (doping), and other toxicology laboratories. JAT is published 9 times per year, with one issue per year designated as the Society of Forensic Toxicologists’ Special Issue. Journal of Chromatographic Science is an international scientific journal, launched in 1963, providing in-depth information concerning the practice and theory of chromatography. The editorial content focuses on research papers describing practical, preparative applications and analytical methods relevant to a broad range of analytical laboratory work. JCS is published ten times per year. Oxford University Press, a department of the University of Oxford, furthers the University’s objective of excellence in research, scholarship, and education by publishing worldwide. The world’s largest and most international university press, Oxford University Press currently publishes more than 6,000 new publications per year, has offices in around fifty countries, and employs some 5,500 people worldwide. It has become familiar to millions through a diverse publishing programme that includes scholarly works in all academic disciplines, bibles, music, school and college textbooks, children’s books, materials for teaching English as a foreign language, business books, dictionaries and reference books, and journals.